FX Renews Atlanta for Season 3More Earn! More Paper Boi! Watch Donald Glover Sway to TLC’s ‘Creep’ in Atlanta Deleted SceneOh ah, oh ah, oh ah yeahhhh! Atlanta’s Silly Yoo-hoo Ad Is a Clever Commentary on Black ArtThe Yoo-hoo commercial isn’t just surreal and hilarious — it’s an acknowledgment of the fraught dynamic between black art and commerce. What Donald Glover Said to Lena Dunham After His Girls ArcDunham told Glover that she hoped his Girls role didn’t tokenize him. Very Tan Caucasians, Your Time on Atlanta Is NowThe latest casting call for the FX series gets very specific. Your Guide to Sterling K. Brown and Brian Tyree Henry’s Everlasting FriendshipThe stars of This Is Us and Atlanta have TV’s best bromance. You’ll Soon Be Able to Watch Atlanta on HuluGood news, since Atlanta’s second season won’t arrive for a while. Coats Were Invented So That We Could Have This Photo of Donald GloverHis Wired photo shoot serves a look befitting Lando Calrissian. Donald Glover Will Be Producing a Lot More Television for FXHe’ll also keep working on Atlanta. Raindrop, Drop Top, Donald Glover Dancing to Migos Is a Must-WatchAdd this footage to the black Smithsonian. 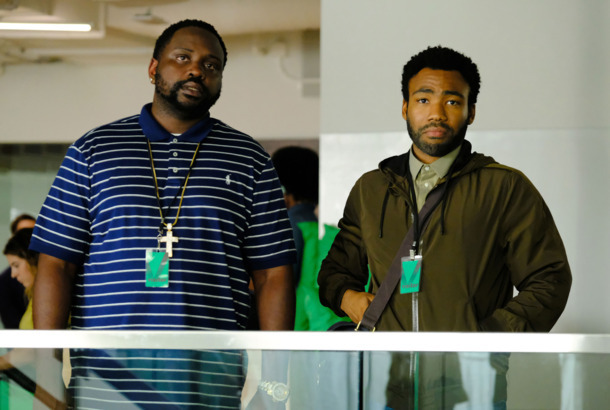 On Atlanta and Its ‘Fake It Til You Make It’ Brand of EconomicsThe first season explored the idea that perceived status is just as important as actual status and real wealth. Why Atlanta’s Police-Shooting Scene Was More Effective Than Others on TVNo one could have predicted that the show to finally get it right would be a surrealist comedy. Here’s What Happens If You Actually Call Atlanta’s Ahmad WhiteAnd it only leaves more questions. Stephen Glover on Atlanta’s Black Justin BieberEven FX was confused. Donald Glover’s Long, Strange Trip From Atlanta to AtlantaThe comedian/writer/actor/musician has made a career out of redefining expectations.